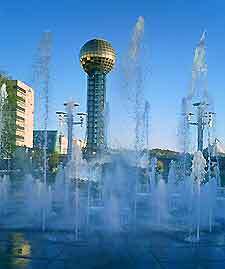 Serving the popular tourist destinations of Knoxville, Pigeon Forge and Gatlinburg, Knoxville McGhee Tyson Airport is a busy terminal that caters to visitors arriving by air in East Tennessee. The facility has frequent daily direct nonstop flights to many major cities across the United States such as Houston, Chicago, Denver, Dallas, Cincinnati, Minneapolis / St. Paul, Orlando, Cleveland, Newark, Detroit, Memphis, Washington DC, Charlotte, Philadelphia and Atlanta. American Eagle, Delta, United and US Airways all serve TYS airport. Knoxville McGhee Tyson is well designed to be extremely functional. The airport features a standard two-level terminal building, with Arrivals, Baggage Claim and Ticketing located on the first floor and Departures on the second floor. Three parking lots provide over 3,000 parking spaces to cater to the parking needs and there is a cell phone waiting area. With a two-level design placing Arrivals on the first floor and Departures on the second, Knoxville Airport follows a standard layout and is extremely easy to get around. The interior is spacious and roomy, with a relaxing atmosphere. The following list provides information on the main airlines that serve Knoxville McGhee Tyson (TYS).